Aside from being beautiful and giving off a powerful perfume that’s quintessentially spring, sweet peas are super easy to grow from seed. And with types that are ideal for cutting, growing in hanging baskets, planting in pots, or training up trellises, there’s a sweet pea for virtually every sunny garden space. Size: Vining sweet peas can reach 5 feet or taller; bush varieties reach roughly 1 to 3 feet tall. Care: Grow in full sun, and water regularly but avoid getting the foliage wet. Planting: In mild-winter areas, plant seeds in September or October for spring bloom; in cold regions, start seeds indoors in February or March and transplant seedlings outdoors as soon as you can work the ground outside. 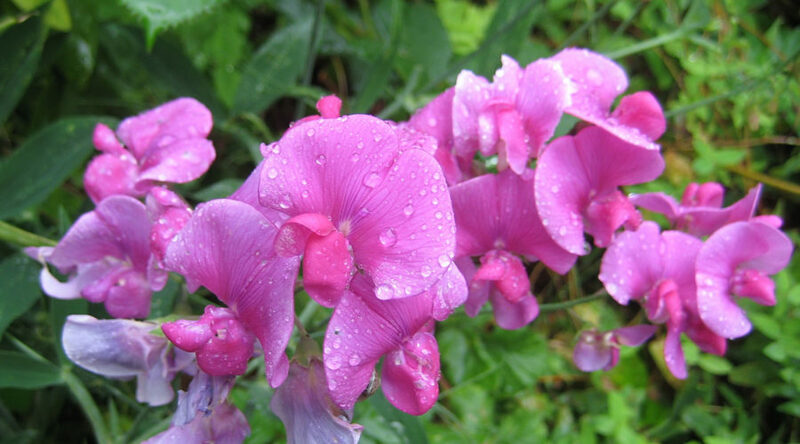 Grow sweet peas in rich, well-drained soil, planting seeds 1 inch deep and 1 to 2 inches apart. When seedlings reach 4 inches tall, thin them to 6 inches apart. As plants bloom, remove faded flowers to discourage plants from setting seed. Companions: Plant sweet peas with sweet alyssum, lobelia, roses, lavender, and catmint.